I’ve been meaning to play Never Alone for a while now. I had it saved on Steam, and I’m not a Steam user, nor am I a PC Gamer, to be honest. It interested me, though, to have a game that’s intended to present a story of a native Iñupiaq people and bring a little bit of their culture to a larger world. With it being on sale, I picked it up on PS4 this past weekend. My regret is that I didn’t play it sooner. There has been a lot of discussion over the past year about diversity in video games. In my opinion, games like Never Alone are an example of how games can grow and expand into new areas to share experiences with people across cultures. I’d describe the game as a fairly simple platform puzzle game that focuses more on sharing with the player than challenging them. It was a short, enjoyable game, that can be played alone by swapping between the arctic fox and the girl or co-op with each player controlling one or the other. I really enjoyed the gameplay graphics. There was a nice blend of slick modern capability with stylization of some characters such as the Owlman or the Manslayer while Nuna and her arctic fox have an almost Pixar quality to them. While often simple, the backgrounds are quite smooth and a pleasure to look at. Unless you’re being chased by a polar bear. Upper One Games did a good job with the view of the screen as well. There’s a slight blur around the edges and corners at times, setting a mood of looking through the blizzard that Nuna and the fox are braving in their adventure. Between levels, the story is told using cut scenes employing an artistic style drawn from traditional scrimshaw. Some won’t care for this, but I particularly liked it. The controls can be a bit frustrating, particularly with the bola, but otherwise I didn’t have much trouble with the game. Jumping was responsive and I only found myself moving wrong when I got impatient. Honestly, impatience is your biggest enemy in this game. There are only certain times that urgency is needed and something is chasing you. Most of my deaths were caused by me trying to rush and not waiting to observe the patterns of spirits or the movements of ice. Much like the lessons taught to children in Alaska, ignoring the natural world around you can have dire consequences. Slow down, observe, and then act appropriately and you will avoid a lot of frustrations during your adventure through a blizzard in Alaska. I can’t say too much about the soundtrack for Never Alone. It was pleasant enough, but not memorable or striking to me. I would have enjoyed if Upper One Games had incorporated more traditional music into it and explored that more. There is a video on the importance of the drum in the culture, but not too much. I will note, though, that I found the yaps and grumbles of the fox quite adorable. The game isn’t hard, really. If you die, you start pretty much right where you went wrong and can try again infinitely until you finish. There aren’t many enemies and you only have to defeat one while the others are about finding ways out of the predicament you find yourself in. The game isn’t long either, taking only about 3 hours to complete with all extra items found, which open videos about the Iñupiaq. The lack of challenge isn’t a detriment in this case; not for me, at least. Never Alone is more about telling a story and giving you insight into the culture and history of an entire people. In that respect, it’s a fine game. I enjoyed the puzzles, particularly where you had to scramble up walls and leap off of them as the fox in order to open a path for the girl, Nuna. However, I found myself enjoying the story quite a bit and any gameplay was largely driven by an interest to hear the entire tale. There is even a moment where something happens that sort of made my heart sink. When a simple 3-hour game with a little narrative and no real dialog from the protagonist can have an emotional effect, even if only a slight one, I would say that’s a success. Then again, I may also be a big softie at this point. Narrated in the Iñupiaq language with English subtitles, there was a certain feel of authenticity (it should, they worked with members of the Iñupiaq, one of whom narrates) and interweaving the videos into the game added some depth to it. Hearing actual stories from native Alaskans about their grandfather’s pet arctic fox or a brother’s pet polar bear were really interesting. I recommend watching the videos as you find them during the playthrough rather than waiting until you’re done. 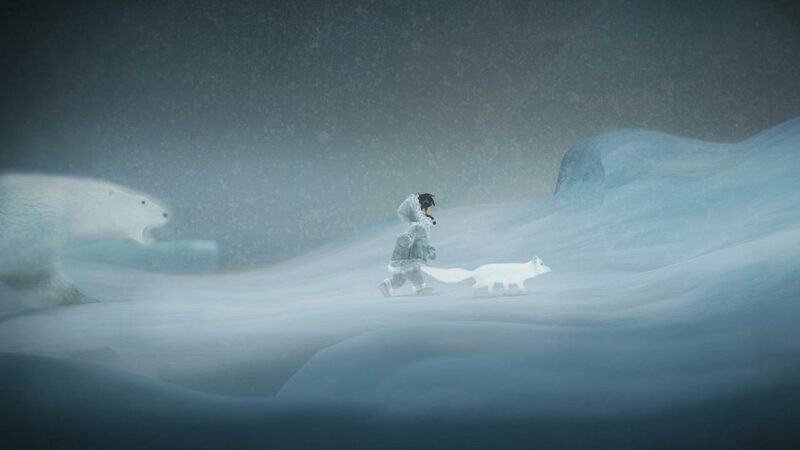 Never Alone, or, Kisima Inŋitchuŋa (“I am not alone”), is a video game telling a story in an interactive method of traditional Iñupiaq storytelling. As players learn, these stories were often told to teach lessons to children about the world and about their people’s history and culture. Perhaps there is a lesson to be learned from Never Alone as well. Video games can help us view other cultures and their stories as well, and even better understand their history. If one is to play the game and take their time, one may also learn a lesson of patience and enjoying some simplicity, even in a video game amidst our current level of graphics and AAA titles. I look forward to more games similar to Never Alone from Upper One Games and if they were able to make an ongoing career from short games like this that let us look at other cultures and stories from around the world, I think I’d be willing to play every one of them. If you have the chance and can get this at a price that seems reasonable, I do recommend giving it a try. Then again, considering the name of the site, I may also have a soft spot for games featuring foxes. It’s been a while since I wrote an entry. Life happens, Holidays come along, you change jobs, and then your PC dies. Really, though, you guys don’t care about my sob story and excuses, so I’m going to just get right back to writing about video games and geekery. We recently learned that Sega is going to be focusing more on mobile games going forward and this week they presented the trailer for the new Sonic game, coming to iOS and Android mobile devices. Let’s watch, shall we? I’ve seen a lot of people saying “RIP Sonic” and that this is the end of the Sega we knew from the days of Genesis and Dreamcast. I’m not so sure. Honestly, this might be the best thing for Sonic. Sonic the Hedgehog first appeared in the self-titled game on Sega Genesis, which was followed with Sonic the Hedgehog 2, Sonic the Hedgehog 3, and Sonic and Knuckles. There were a few other titles, like Sonic 3D Blast and Sonic Spinball, but for “core” continuity games, Sonic 1-3 plus the Knuckles add-on are the main ones from the golden days. Some feel the Game Gear versions of Sonic and Sonic 2 are even better than the Genesis versions, though. The games were notable for their gorgeous graphics at the time and many, including myself, feel the music was outstanding for its time. Seriously, listen to this. Personally, Sonic 2 is still my favorite of them, both in game and in music. Sadly, Sonic has not transitioned well as games have moved forward into more three-dimensional offerings. The first such adventure, aptly named Sonic Adventure, on Sega Dreamcast was a pretty solid and most seemed to agree Sonic Adventure 2 was a good game. I think some disagree on which of the two was the better one. But after that, Sonic never seemed to find his footing. The switch to a behind the back third-person view seemed to limit the blue blur from the dizzying speeds he was previously known for. Even the first Adventure game has some criticism for slowing things down with other characters, particularly Big the Cat and Froggy. I’ll admit there’s something quirky about that game and its setting. I realize Eggman is human, therefore other humans would logically exist on the planet, but it seemed odd having Sonic and his pals being the only non-humans. I never understood why Sega didn’t leverage their apparent partnership to utilize the world of Mobius from Archie Comics’ Sonic the Hedgehog series (which also shared the setting with the outstanding Saturday AM cartoon). Utilizing Sally, Bunnie, Antoine, and Rotor would have been a far better use of characters and setting if playstyles were going to be slowed down when not playing Sonic. But I digress. The point is, Sonic hasn’t sold well in 3D situations. The most recent installments, Sonic Colors, Sonic Unleashed, Sonic and the Secret Rings, Sonic and the Black Knight, and most recently Sonic Boom have all had negative to lackluster response with Sonic Generations faring slightly better. And that brings us to the announcement of Sonic Runners and the trailer at the top here. Honestly, I think it might be good. The mobile platform encourages more simplistic gaming and fundamentally almost requires a return to the Sonic roots on Genesis and Game Gear. It’s possible that having Sonic step away from the modern generation of game consoles or PC gaming gives him a chance to show off his strengths. Rather than competing with gameplay and designs that simply don’t work for the blue streak of quilled lightning, a 2D side scroller seems a better fit. The only alternative I can think of that would allow Sonic’s strong suits would be focusing on handheld options for Playstation Vita and Nintendo 3DS. Or perhaps Sega should even consider offering him up to an Indie Dev. I’ve heard good things about the fan games Sonic: Before the Sequel and Sonic: After the Sequel.